By now, everyone probably has heard, read—and tweeted—about the Washington Post article, published online November 28, that exposed the ongoing Twitter wars among RDs engaging in heated discussions on farming practices, sustainability, corporate sponsorships, and other controversial issues. Dietitians love using Twitter to spread nutrition messages, host chats, and engage in conversations about diet and nutrition related to chronic disease. But in recent years, RDs also have been using Twitter to mock, insult, humiliate, belittle, and harass one another during disagreements on many issues impacting the profession. According to the article, some believe the enmity "reflects deepening ideological divides" on these and other topics. The article included interviews with six dietitians who shared their painful stories about how they were bullied and harshly criticized on Twitter for simply voicing an opinion or allegedly making false statements during a conference presentation. The vitriol, they say, has the potential to damage reputations and hurt nutrition businesses. This behavior isn't exclusive to the dietetics profession; it's pervasive in our society, involving everyone from young children to adults and from the lowliest jobholder to the one holding the highest office in Washington. Amid this escalating trend, the Academy of Nutrition and Dietetics recently published Professional Civility guidelines in Food & Nutrition magazine, encouraging everyone to take the pledge of professional civility that entails "demonstrating respect, supporting constructive dialogue and positive engagement, discouraging public belittling of colleagues, and modeling professional conduct in all public communications and actions." In my opinion, this isn't too much to ask of dietetics professionals who want to be taken seriously as "the" nutrition experts in the medical community and on Capitol Hill when fighting for certain legislation to pass, who want to be part of interdisciplinary health care teams in all medical specialties, and who want to be top of mind whenever physicians make referrals for nutrition counseling. It's one thing to have spirited discussions on Twitter and other social media channels, but when dietitians hit below the belt in word and deed to get their points across, they make themselves and the profession look bad in the eyes of all who are watching. So the next time you're on Twitter debating a controversial topic, always demonstrate respect and, when all else fails, simply agree to disagree. Head over to our Reader Feedback page to learn what your colleagues said about the Washington Post article. 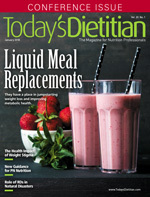 In this issue, Today's Dietitian features articles on weight stigma, new guidance for using parenteral nutrition, and liquid meal replacements. Please enjoy the issue!